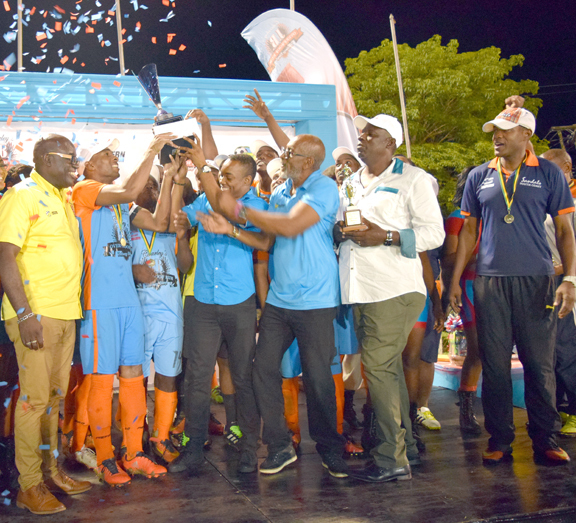 Sandals South Coast are the JFF/Western CONFED Super League champions following a scintillating 4-3 victory over a spirited Montego Bay Boys and Girls Club in the championship game played at the Montego Bay Boys and Girls’ Club on Sunday. Leonardo Rankine, with a first half double and the irresistible Devin Campbell, with a double in the second half, did the scoring for the eventual winners who gained their first-ever hold on the crown, bettering their position of last year, which saw them beaten in the final. In what was their first appearance, Sandals were defeated on penalties in last year’s final by Granville. Campbell, who had an influential hand in the contest, was also named Most Valuable Player of the final. Leroy Christie, with two powerful headers and Shane Reid, replied for the first-time finalists Boys’ Club. For their efforts Sandals gained qualification to JFF National League playoffs, scheduled to get underway later this month, which will yield two qualifiers to the Red Stripe Premier League and also walked away with $200,000 plus the winners trophy. In a feisty affair which got very competitive towards the end, MBBGC were forced to play the final 20 minutes with ten men after veteran, Michael Thompson, was given marching orders for two bookable offences. The beaten finalists received $120,000 for their efforts, while Wadadah, for finishing third, bagged $90,000 and Faulkland collected $60,000. A delighted Aaron Lawrence, coach of the Sandals South Coast team, told reporters afterwards that it was a title thoroughly deserving. “We have been fighting for the past three years to get this championship and we have it now. We have to regroup as we made some mistakes and gave up some soft goals and we just need to work on them. “It was an excellent game tonight, Montego Bay Boys’ Club came out and gave a good fight, but we were superior to them but all said and done, it was a good show. We will now just start our preparations for the playoffs,” he noted. Sandals started out the better of the teams and got the early goal just six minutes in when Rankine dropped his head low to direct a ball past Garnett Dennis in the goal for the Boys’ Club team. Boys’ Club found the equalizer on the half hour mark when a mistake by their custodian gifted Christie a sitter, which he duly nodded in to level the scores at 1-1. Boys’ Club had barley settled when Sandals re-established their lead when Rankine carved open the Boys’ Club back line to slot in the ball past an advancing goalkeeper, as they went into the break with a narrow 2-1 advantage. Sandals continued where they had left off in the second half and went 3-1 ahead when Campbell powerfully headed into an unguarded side of the net, after a driller had sucked the entire defense to the other side of the goal. Boys’ Club again clawed their way back from the penalty spot after they were hacked down, before Campbell put the game to bed in the 75th minute, firing home from just outside the 6-yard box low into the left hand corner of the net with precision. Campbell got at least two other chances to widen the margin of victory but was thwarted by stunning defending and a faulty shooting in one instance.